Imagine the perfect pep rally: screaming crowds, neon lights, and cheerleaders doing all kinds of stunts. Would you want to be a part of this and fit into the theme for the week’s pep rally? Involvement from every student could make the pep rally louder, crazier, and more fun for everyone. But in order for this dream pep rally to become a reality, more students need to dress to the attire. The reasons why students aren’t dressing up is because they don’t want to spend money, or they don’t have time. But what if there were an easier way to dress up without spending your money or wasting your time? Believe it or not, they’re many options to choose from. “I’d rather not spend my money on something I’d wear only a couple of times,” Sophomore Camille Halverson said. “I think some people don’t dress up because they don’t have stuff in their closet, or they don’t have time,” Sophomore Maya Leflore said. Cheaper options such as Walmart, City Thrift, Party City, and Dollar Tree are spread out through the Jackson/Madison area. Students have easy access to these stores that sell inexpensive clothes. “City Thrift have tons of options of clothing and it’s all super cheap,” Senior Guy Easterling said. “I suggest going to Walmart or Party City because they are easy to go to and grab something quickly,” Sophomore Elizabeth Wells said. For the pep rally on Aug. 31, 2018, the theme was 80’s or glow in the dark. Many students brought glow sticks for their neck, ankles, shoelaces, and wrists. “I got four packs of glow sticks for four dollars and was able to supply for half the grade,” Sophomore Emily Herrington said. Another problem that occurs when trying to dress up is not being able to drive. The freshman class, as well as majority of the sophomore class, don’t have the opportunity to drive themselves to one of these local stores. An easier option for these students would be DIY costumes. 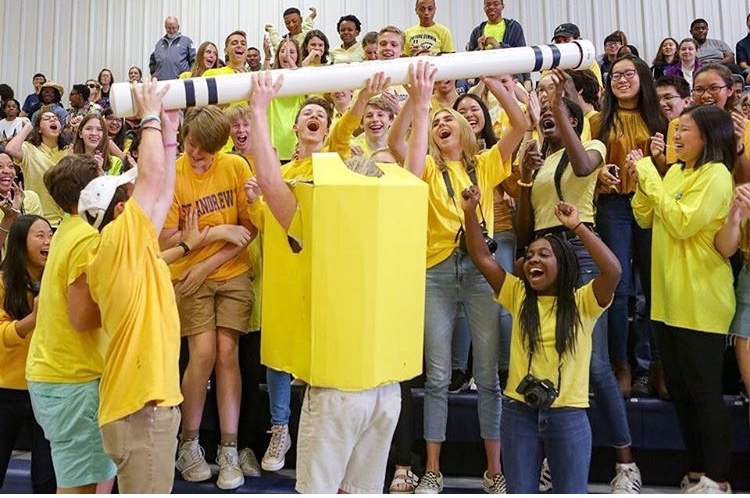 Junior Will Davis has come to the homecoming pep rallies in a large box for the past two years, and each of those years, the junior class of 2020 has won the spirit stick. In 2017, the homecoming theme was “Wizard of Oz” and Davis came as a yellow brick. This year, the theme was “Back to the Future” and Davis dressed up as DeLorean. DIY costumes are more creative and make your class stand out. However, DIY doesn’t always mean making your own clothes; instead, finding an old poster to decorate, a pair of sunglasses, or a hat that could fit the theme. Many students have said they are able to find clothes from their closet and work with it to meet the attire. “Mainly when I dress up, it’s stuff from my house,” Leflore said.